No matter how long you teach, the turning of the semesters is kind of exciting. The countdown to commencement, daunting piles of grading, and finally “being done” mark a familiar rhythm season in and season out. But the other semester’s milestone is something we don’t seem to talk about as much – the day your evaluations come in. I was especially anxious about this last round of student comments for a couple of reasons. Fall was my first semester back teaching in my home department after spending several years out on assignment with NAU’s now-defunct University College. 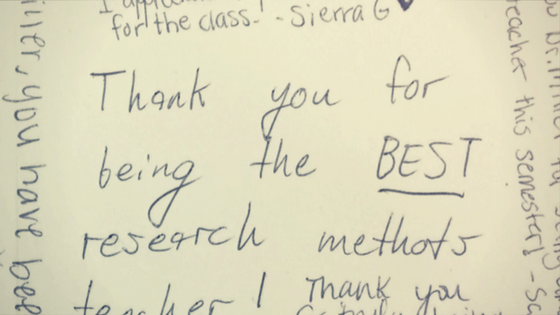 For my re-entry, I taught research methods, a required class for majors that regularly pushes students (and sometimes instructors) out to the limits of what we can handle. It’s not a weed-out class exactly, but it’s a huge milestone for psychology students, one that I blogged about at the opening of the semester as I reflected on ways to set the stage for a good experience in a class that no one takes for fun or by choice. Thanks to NAU’s new online evaluation system, my results came in much, much faster than I had anticipated. I got them three days after the semester ended – well before I really had time to brace myself for unfiltered feedback from the people who watched me profess for three months straight, on good days and not-so-good days. I had a reasonably good feeling about what they might say, given that this semester was the first one in my career to culminate in an actual, formal thank you from the class – a card solemnly, and touchingly, presented right before I handed out the final. And we did end up with a real group camaraderie and bond, which perhaps grew out of the stresses of the class coupled with my need to prove myself again as a psychology teacher. It felt like the class ended on a good note, but as we all learn eventually, the face to face interactions we have with students can be vastly different than the feedback we get on anonymous evaluation forms. Cutting to the chase, the comments were good-to-great, and my numbers were fine too. I was happy and proud, of course, but most of all relieved. It wasn’t just relief that the students came away satisfied with what felt to me like a semester of frantic last-minute preparation mixed with the occasional shot of raw panic. My department colleagues read these too as part of our annual evaluation process, and so bad comments are embarrassing. Of course we all get them from time to time, but enough really critical ones and your reputation as a competent professional starts to slide. I think that most of us who teach for a living learn to take student evaluations in stride and for granted. But they still strike me as a strange ritual, one that rolls together reward, criticism, revenge and acute personal and professional vulnerability. I’ve been around long enough to remember when end-of-semester anonymous evaluations first came on the scene; the first I ever saw came midway through my college career, a paper form handed to me by a new adjunct instructor hoping to build a portfolio that would land her more classes. Then a few years later when I was a graduate teaching assistant, I experienced the process from the other side when we were presented with envelopes full of Scantrons summarizing what the students in our breakout sections though of our teaching. The day those envelopes arrived in the grad student mailroom was a bruising one for many. Some of us would stay behind locked office doors for the rest of the day; others, the ones with brasher self-confidence, would pick the worst comments and post them on those office doors as a defiant statement of how little we cared about what our students had to say. I suspect that we all did actually care; if nothing else, it was like the the slam books we used to pass around in junior high, terrifying to read but holding the promise of learning how we really came across to others. As for how I came across to my first crop of students, the picture was not good. I was simply stunned at the disparity between what I thought I’d presented and what they perceived, and at the number – a minority, but still – who felt demeaned and alienated. All important lessons, and ones that helped me build the teaching practice that I have today. But did it have to be that hard? Even as we teachers gain skill, and our comments become more “uniformly positive” (in the parlance of my annual evaluation committee), I wonder about the impact on us, as academics and as human beings, of this semesterly ritual of anonymous rating and comment? I don’t know that this is a question really addressed by the research literature, despite the fact that this literature is truly vast. Evaluation of teaching is a well-plowed field in the scholarship of teaching and learning, leading to more articles than can even be summarized by a good meta-analysis (of which there are also quite a few). Nor does this literature go unread – if anything, research findings on evaluations have gotten to be reliable clickbait in higher education reporting, as described in this excellent blog post by Elizabeth Barre of Rice University’s Center for Teaching Excellence and in this podcast over at Teaching in Higher Ed. And yet I think there’s more we can ask about this aspect of evaluations. Especially for faculty of color and women faculty, experiencing the brunt of anonymous comment surely drains off some measure of our energy and confidence. There is reason to believe that systematic bias does happen in teaching evaluations, for example, from this recent study on the impact on evaluations of the perceived gender of the person teaching an online course. Back in my graduate student days, I also got some comments that would have been considered sexual harassment in any other context. They weren’t frequent, but of course they were the ones that stuck with me. The comments I get these days, by contrast, are generally respectful even when they aren’t positive, which also makes me believe that the culture of student evaluation may differ significantly across institutions. Perhaps at some, evaluations are more reflective of the online commenting culture where the wittiest and cruelest wins – or of Ratemyprofessor.com, home of “easiness ratings” and the infamous chili pepper. At mine, fortunately, they are not. Some comments are totally off-base, but none (so far) have been obviously biased or intentionally mean. Even so, they are still stressful to read, and I think we ought to weigh that somehow in judging their value. This is especially true for newer faculty, given that we commonly advise them to pile even more evaluation on top of the official regimen, touting personalized, unofficial mid-semester surveys as a good way to improve. The assumption is that more feedback is always better, but is this correct? Surely at some point, we enter into The Man, the Boy, and the Donkey territory, endlessly tweaking what we do to please everyone, and ending up pleasing no one. Back when I was doing the Teaching Practicum course for our graduate students, I tried to prepare students for the role that anonymous evaluations would play in their careers. We read a little of that (again, vast) literature, talked about how to incorporate evaluations into their job application portfolios. I gave them some strategies for pushing the numbers up and heading off really bad comments. And I did try to prepare them to handle reading those really bad ones, even sharing with them the very worst of the worst comments I got my first time around as a means of giving perspective and instilling a growth mindset. But I still have more questions of my own – such as how we ought to handle getting good evaluations. This time around, I had near-perfect numbers in a couple of categories, and from the comments I can conclude that students liked me personally and liked the class far more than they expected to. Does that mean I ought to teach the class the exact same way next time? Does it mean that I provided more value than the instructor down the hall with less experience, a different mix of student personalities, less appealing ways of handling problems and complaints – whose evals weren’t nearly as good? Relief, gratitude, pride – these are all probably good things to feel when you get a nice crop of evaluations. But never complacency, of course, and that’s what I have to keep perspective on when I look back at this last semester. What’s been your experience? And where do you think the discourse on student evaluations ought to go next? Extra credit: This American Life, Is That What I Look Like? Previous Post What is boredom – and can teachers do anything about it?